These are tried and true techniques that will work for you for IF you follow the directions. We have made it easy for you just follow our lead and we promise not tell your friends that we helped you with anything....ssssshh our little secret. If you have not purchased a BBQ yet, the hands down pick to be a Patio Pitmaster is the..
Weber Smokey Mountain known as the WSM. With nicknames like, Wicked Smoke Machine, R2D2, Want Some More, ADD, and many more. The WSM is one of the most affordable and efficient charcoal fueled BBQ's in the world. The boys at Weber know a thing or two about a BBQ and this is no exception. You will not find WSM's at most big box stores. If you do, they certainly will not be up front where the weekend wiener grills are on display. A Weber Smokey Mountain is found in specialty BBQ stores (read expensive BBQ stores) and online. During BBQing holidays starting May, the WSM can be found on websites 10 to 15 dollars off the lowest price all year. If you cannot and will not play the sales game, Amazon.com has consistently had the lowest price on the Weber Smokey Mountain. They ship directly from Weber and the shipping is FREE (if you have the Amazon Prime membership). Add in no sales tax and you have quite a deal. If you already have a BBQ like a kettle style grill, a side by side, or an electric smoker, you can still use everything you will learn on this site, but you will have slightly more things to do to keep the fire going. A WSM is a fill once with fuel, and don't mess with it again - even for a 14 hour cook! We will be the first to admit we were trained to be lump charcoal BBQ snobs. 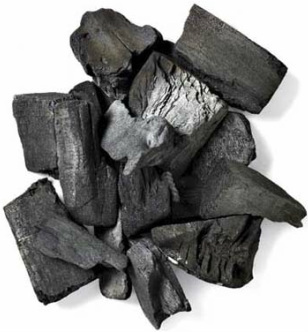 Ask any pitmaster which is the better fuel (processed briquets or lump charcoal) and you will never get the same answer. Some exclusively use one or the other, some use both, some don't know why they use it at all. There are entire websites devoted to which charcoal burns better and to that we say way too much time on someones hands. If you do decide to use briquets, make sure to use a natural briquet with NO built in lighter fluid. You don't need it, and it will ruin your BBQ taste. You will be lighting your fuel (either lump charcoal or briquets) using the Minion Method below for all your cooks. Pros: burns extremely hot, natural wood - no fillers, adds to flavor of the meat, looks and sound cool when "popping"
Starting your BBQ for a low and slow cook is easy. There is one method to use, and one method only. The Minion Method (named after BBQ guru Jim Minion) has been used by hundereds of thousands of pitmasters for one reason, it works. Do not try to get a fire going any other way. Placing lit coals on top of a bed of unlit coal will allow the fire to "be fed" for the entire cook. No mater how awkward it sounds, it works. Carefully pour the chimney starter full of coal onto the bed of unlit coals and spread evenly with long handled BBQ tongs.